The museums in Lisbon are numerous, over fifty, and there's something for all tastes! In other words it will be impossible to visit them all in less than 3 days. The city of Lisbon combining originality at the crossroads of several cultures, the museums of the city derive their originality and variety. The Universal Exhibition of 1998 helped promote modern in recent years, and most museums are focusing on the history of the city or Portugal. can try to combine the museums of Lisbon into four main categories, although they sometimes overlap: the historical museums, science museums, museums of ancient art and modern art museums. 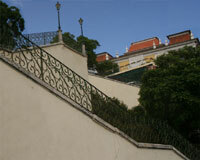 Few guidebooks mention it because it is not sufficiently known, and it really speaks to Lisbon! But we appear to be very interesting to see when we look indispensable in Lisbon, in addition to the museum facing the Portuguese colonies. The city museum, or Museo da Cidade , presents the history of Lisbon since the early Neolithic to modern times through occupation of the Visigoths, the occupation by the Moors. The museum also has a focus on the Lisbon before and after the earthquake. there are of course also engravings, paintings .. The Maritime Museum of Lisbon is located in the district of Belem, the Monastery of Geronimo. Given the naval tradition of Portugal, is a museum partiulièrement rich treasures, right, left ... Our board, with one stone with 3 hits visit the Monastery and Belem Tower next door. The National Museum of Ancient Art is hosting a dozen permanent exhibits throughout the year on Portugal but also its influential neighbors. St. Vincent is the patron saint of Lisbon, there is a masterpiece Adoration of St. Vincent , Nuno Gonçalves dating from the mid-fifteenth century. but also the famous paintings Tentation de Saint Antoine and Saint Jerome in Prayer , the respective works of Hieronymus Bosch and Dürer Albrect. On the first floor is treasures settlements and places where are the Portuguese. The Portuguese art has also developed around the pottery, with influences sometimes associated with discoveries and conquests. The tiles, ceramic tiles, painted and assembled into decorative frescoes. It is also found tiles and furniture, Portuguese, Chinese porcelain ... This museum is located at the foot of the castle of St. George and not far from the cathedral, convenient to make a stone three coups. The Museum of coaches is one of the most visited Lisbon, it presents an outstanding collection of carriages dating from the seventeenth to the nineteenth century. Through the various models, we rediscover the evolution of transport technologies and trends in the tastes and colors of decorative arts. 2 museums have retained our attention, the museums of the Calouste Gulbenkian Foundation: the Calouste Gulbenkian Museum himself and the Museum of Modern Art . For lovers of art these museums are exceptional and unavoidable! Add to bookmark this page Portugal " Museums in Lisbon " - Firefox do "Ctrl D"